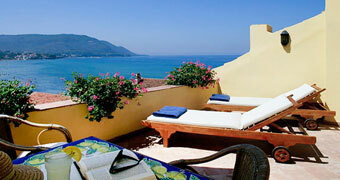 Palinuro is one of the Campania region's most famous bathing resorts, a true jewel of the Cilento Coast. 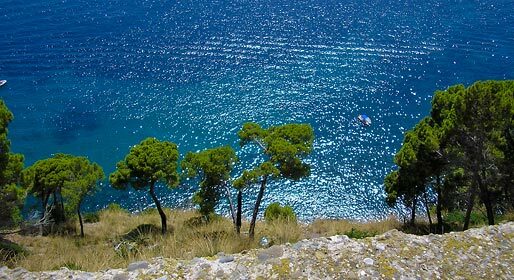 The name Palinuro recalls the character in Virgilio's epic poem "The Aeneid", character who according to the legend, was responsible for bringing Enea to this part of the Italian coast. 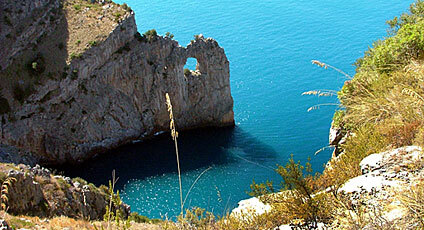 For those approaching by sea, the sight of the cliffs of Capo Palinuro announces their arrival. It would be foolish to disembark without having first seen the Natural Arch or Palinuro's fabulous sea caves: the Grotta Azzurra, known for its unmistakable blue colour; the Grotta del Sangue, tinged with the red hues of the algae present within the cave; the Grotta dei Monaci, where the sea has eroded the walls of the cave in such a way as to have created forms similar to that of figures bent in prayer; and the Grotta d'Argento, which offers an enchanting display of shimmering silver light. Once in the town, visitors should not miss a tour of the Palazzo Baronale Rinaldi where, in 1814, Gioacchino Murat resided during his time spent in Palinuro inspecting and amplifying its forts and block houses. Also worthy of visit, the Antiquarium where to admire exhibits retrieved from the remains of an ancient Greek Necropolis, dating back to the 6th century B.C.